I was mulling over how to get my message across to the Woodland Heritage readers when it occurred to me that ‘Heritage’ is the central issue. What if Britain’s most iconic and important broadleaf tree, the native Oak, was to be reduced to a shadow of its current level? How would this affect the heritage we pass on and what would it say of our curatorship of it? The robust English or Pedunculate Oak, Quercus robur, and the stately Sessile Oak, Q. petraea, are intrinsic to the environment in Britain. Oak is also a key ecological component of woodlands, and significant in parkland and garden landscapes in rural and urban settings. Without doubt it is an important part of British cultural heritage as well. Surely it is unthinkable that we could be without them. Oak is ‘tough and well prepared for several maladies’ as Bede Howell (who has 50 years forestry experience) recently pointed out at the Gloucestershire RFS day in the Forest of Dean. Experience and documentation tell us however, that there are some pest and disease attacks that Oak cannot survive. Oak wilt caused by the fungal pathogen Ceratocystis fagacearum is one such example and fortunately does not occur in Britain but is fatal to Red Oak in North America. But a new and sinister threat to the existence of native Oak in Britain has made an appearance in England and Wales, and is spreading. What is worrying about this new ‘disease’ is that a significant number of trees are said to die within three to five years of the onset of symptoms and an increasing number of sites are reporting symptomatic trees. Many Oak trees in Britain are already affected by existing pest and pathogen problems and this together with a new, very destructive and easily transferable pathogen could place overwhelming pressure on trees in their prime. 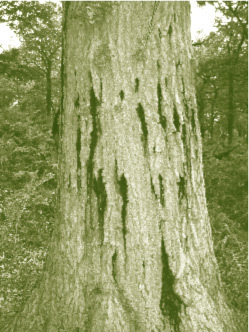 Termed Acute Oak Decline (AOD) this damaging condition occurs on mature Oak (trees more than 50 years old) and is identified by dark, vertical stains or streaks of fluid on trunks of affected trees, a symptom called stem bleeding (Figure 1). Both Pedunculate and Sessile Oak are affected. In an advanced stage of attack symptoms are unmistakable (Figure 2): extensive bleeding or oozing of tarry fluid from multiple small splits in the bark (Figure 3) occurring at close intervals all the way around and up the stem, even progressing into the canopy. In the early stages when there are fewer bleeds restricted to certain parts of the trunk, diagnosis based on symptoms can be difficult. Other agents can also cause stem bleeding for example Phytophthora and even the honey fungus, Armillaria. That is why verification of the cause of stem bleeding is essential to confirm AOD as the culprit. Unlike the highly visible stem symptoms, the canopy of trees with AOD may not show any indication that the tree is affected until it is close to death. The inner bark or phloem is the primary area of the stem that is attacked. This tissue is killed and broken down leaving fluid filled cavities beneath the bleeding points on the stem (Figure 4). Phloem is the food conduit of the tree transporting nutrients to the roots and if it is sufficiently disrupted and broken down it leads to death of the tree. At Forest Research we are working hard to understand the cause of this episode of AOD but as with all declines it is unlikely to be simple; there will probably be more than one agent involved. However, that said, the current thinking is that a bacterium is likely to have a key role in causing the stem bleeding. This organism, soon to be named, is new to science. The next immediate research priority will be to scientifically prove that this bacterium does indeed cause the bleeding patches, a process called ‘Koch’s Postulates’. This is achieved by inoculation tests. Once trees in the environment are infected by the bacterium further attack by other organisms such as the larval stage of the buprestid beetle, Agrilus biguttatus (previously known as Agrilus pannonicus) will hasten tree death (Figure 5). To date all known cases of AOD are self reported, with 57 sites currently known, but the number is growing weekly as new cases are drawn to our attention. The focus of the outbreak appears to be the Midlands but extending to the south and south-east. Because diagnosis of symptoms is not straight forward new sites need to be visited and a sample must be taken to verify whether the bacteria are present. A few cases reported to us turn out not to be AOD. Site visits and sample verification are both costly and time consuming. However, in all cases where we have been able to carry out diagnosis the bacteria have been present and this adds to our confidence of its causal role. A similar condition has been discovered on Holm Oak (Quercus ilex) and the Pyrenean Oak (Q. pyrenaica) in Spain. In cases where symptoms of extensive stem bleeding and tree mortality are reported, Spanish scientists also implicate a causal role for bacteria. Our tests show that the British and Spanish bacteria from Oak trees with symptoms of stem bleeding are the same. Once again this contributes to accumulating evidence for a primary role of the bacteria. We are making inroads into answering to the question of how AOD is transmitted but this is likely to take several years of research. In a joint project between Forest Research and Imperial College London, an MSc student Nathan Brown, did a study on the spatial distribution of affected and nonaffected trees at four sites last year. He found that symptomatic trees do not appear randomly on a site but tend to be in clusters. This suggests that infection spreads from initial infection points. There was also a significant co-occurrence of AOD symptoms with exit holes of the buprestid beetle Agrilus biguttatus suggesting that Agrilus might play a limited role as a vector of AOD. 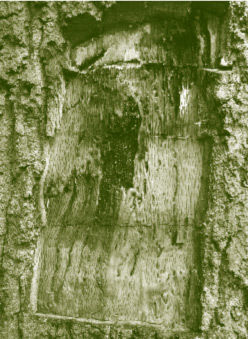 However, Agrilus exit holes were only observed on a small number of Oaks with bleeding symptoms so it may simply be behaving as an opportunist, which attacks weakened trees. Clearly a key issue facing us is how to manage this problem to reduce losses, and contain and prevent spread. Time is of the essence because it appears that the incidence of AOD is increasing and the epidemic is therefore moving closer to a tipping point beyond which it may be out of control. Management research is urgently required. At the moment AOD management guidelines are available but these are based on general principles and what is really needed are evidence based answers. The issues are complex and for example, if felling is used as a management tool, there are serious implications for practices around stump treatment, removal and disposal of the bark and sapwood, as well as timber salvage. Recommendations based on results of research that has been specifically designed to work out the best way of managing infected trees in different situations are therefore required. Apart from research to underpin management of affected trees there are other core issues that research has to address urgently. These were identified at the request of the Director General of the Forestry Commission and are under discussion by the Commission with Defra. The research will be costly and raising the funding difficult but progress depends upon resource. Forest Research will have to bring a component of the funding in from external sources and will continue to seek this support from stakeholders. Woodland Heritage is exemplary in this regard and we are most grateful to the organisation for procuring some funding already which, together with a contribution from Natural England, has allowed surveillance of more sites with suspected AOD. 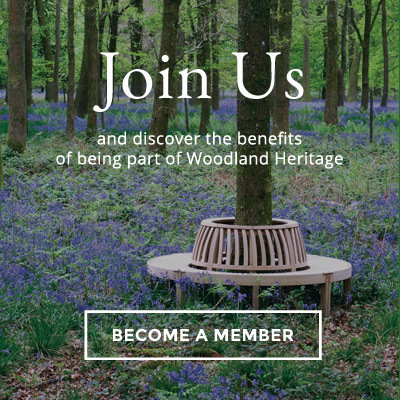 We welcome the participation of Woodland Heritage and on behalf of the Oak team – Susan Kirk, Nathan Brown and Joan Webber – I thank your charity sincerely for what it has achieved to date. These efforts aid us in safeguarding Oak for future generations. Sandra Denman shows an Acute Oak Decline trial on Oak saplings at the Alice Holt Research Station. Trials on mature trees still have to be conducted to reproduce the disease as it occurs in the environment. Sandra Denman’s plea for supplementary funding has certainly not gone unnoticed by the Trustees of Woodland Heritage because Acute Oak Decline (AOD) is potentially a catastrophe waiting to happen. Therefore we have been proactive in joining together with other tree and woodland organisations in raising the profile of this vitally important issue. Woodland Heritage, The National Trust, The Woodland Trust, The Tree Council, The Royal Forestry Society, The Arboricultural Association, Natural England, The Duchy of Cornwall, The Institute of Chartered Foresters and The Country Land and Business Association have collectively written letters expressing their concern at the potential threat AOD poses to Britain’s trees to Hilary Benn (The Environment Minister) and Huw Irranca-Davis (Natural Environment Minister). These letters have astonishingly gone unheeded! Much publicity has recently been given to a very serious disease called ‘Sudden Oak Death’ (SOD). The name originated in America where more than a million Native Oak and Tan Oak in coastal forests of California have been killed by a fungus-like organism, Phytophthora ramorum. This pathogen is also present in Britain but here inoculum is mostly produced on leaves and shoots of wild Rhododendron ponticum from where it spreads to stems of susceptible tree species and causes lethal stem cankers. Although Britain’s Native Oaks have low susceptibility to P. ramorum other tree and shrub species are highly susceptible. At present SOD is causing serious concern in the West Country because sadly, it has now spread to plantation-grown Larch and is killing trees in parts of Cornwall, Devon and Somerset. Massive Government funding through DEFRA was approved to combat SOD — and no-one could doubt this decision. However, the sooner H.M. Government recognises that AOD has the potential to be a far more serious disease affecting our Native Oak trees the better. Already a major swathe through the finest Oak growing regions of England is affected with AOD. It is patently obvious that action from our Government to fund Forest Research to help rescue Britain’s iconic Oak tree is now at a critical point. The cost will inevitably run into several millions of pounds, but future generations will not forgive us if we do not act now! BBC West Midlands - Inside Out: Acute Oak Decline at Attingham Park, by Clive Dunn.